A male friend recently asked me why I didn’t include men’s stories at Friendship Dialogues. When I decided to launch a website about the value of friendship and how to cope when those relationships ended I knew that I wanted the site to be for women and about women. I understood that there were women whose best friend was a man, but the stories I was interested in were those told by women about their closest female friends. I could have included stories from men about their men friends too. 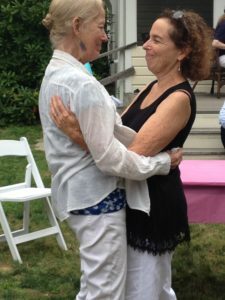 But I knew that women’s friendships were based on connection and a need to communicate, to be heard and to listen. To hear your feelings echoed back to you. And that was what I wanted to focus on. The give and take that occurs when women discuss their feelings leads them to something called “mutual empathy” and helps women express their feelings more fully. Miller and Stiver said, “Mutual empathy is the great unsung human gift. Out of it flows mutual empowerment.” As women connect they help each other act and change, which is essential for psychological development. Women come to know themselves, each other, and the world around them through the exchanges they have with each other. From my own experiences I understood that men were less likely to talk about their feelings with women and with other men. Jane E. Brody, in an article in The New York Times entitled “The Challenges of Male Friendships,” said, “Consciously or otherwise, many men believe that talking about personal matters with other men is not manly.” And I have found that when women talk to men about their problems, men are more likely to try and fix the problem rather than just listening and letting the woman vent. Perhaps that is changing and millennial males are more likely to be emotional with their male friends than baby boomer males are. I hope so. I would certainly like to see men be more communicative with other men since that could provide them with all the powerful emotional and health benefits women get from sisterhood. A change like that could also spread into men’s relationships with women, which would strengthen those connections. Then, instead of trying to fix a woman’s problem, a man might be content to listen, sympathize, ask questions and encourage her to do what’s in her heart.